I’m not really sure how I became this “crazy” marathon runner who’s current goal is to run a marathon in each of the 50 states. If someone had told me 2 years ago that I would be running more than one or two marathons a year, I wouldn’t have believed them. In fact, I would have thought them to be the “crazy” one. Somehow, something changed. Maybe it was the fact that I would train so hard for ONE marathon a year and then never get the desired result due to injury, training fatigue, life, stress or weather. Maybe I woke up one day and decided there were so many great marathons and too little time to run them. Maybe my kids were driving me crazy and I decided to run more and drink less to blow off steam. Maybe and most probably, I decided that if I ran more marathons, I could run fewer of those unsupported, boring, long runs. Yeah, that’s probably it. Regardless, I’m on a journey that is taking me places. Some of those places weren’t exactly on my “must visit” list. And that makes things interesting in a fun and adventurous way. 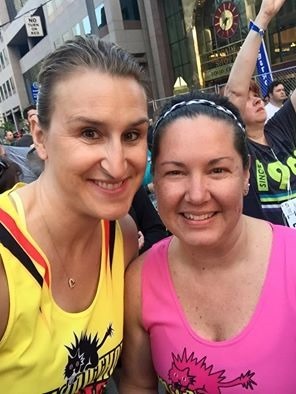 On that note, we picked the Pittsburgh Marathon the way that we pick most of our races. Julie said, “Hey, I’d really like to run a marathon at the end of April or beginning of May.” I said, “If you wait til the beginning of May, I’ll go with you”. Then we looked at the marathon calendar and tossed out a couple options. I saw that Pittsburg was on May 3rd, pulled up google maps and discovered that it’s only 4.5 hours from my new home. We registered a month in advance because Pittsburgh is in PA and that’s a new state for us. Done. Pittsburgh, HERE WE COME!! Pittsburgh, we came to find out is the City of Bridges. I love bridges. There are varying reports as to the exact number but according to Popular Pittsburgh, there are almost 2,000 bridges in the area! More bridges than Venice, Italy! What? Really? Check out this article HERE to see some of those amazing bridges and the history behind them. Race weekend. We enter the city and it’s a pleasant surprise. Nice city. Lots to see & do. Great expo. Bridges, bridges & more bridges. And hills. Hello hills! Course map below. Elevation chart, showing elevation climbs up to 985 ft. That’s a lot for us Midwestern flatlanders! Regardless, we kinda laughed about the hills cuz what could we do? Nothing. No need to ruin the experience by stressing about the course. 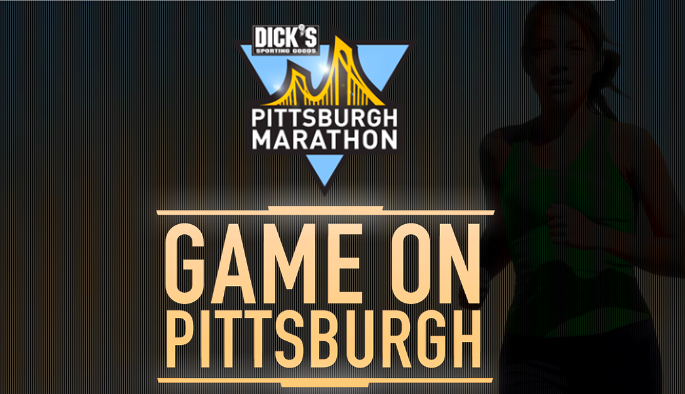 We’ll run Pittsburgh the way we run every race, mile by mile with one goal in mind, the finish. First some sightseeing: The Strip District for shopping and walking around. Market Square which we found a little too late, lots of bars, restaurants & shopping. Home of the Pittsburgh Steelers & Steeler PRIDE everywhere. University of Pittsburgh. 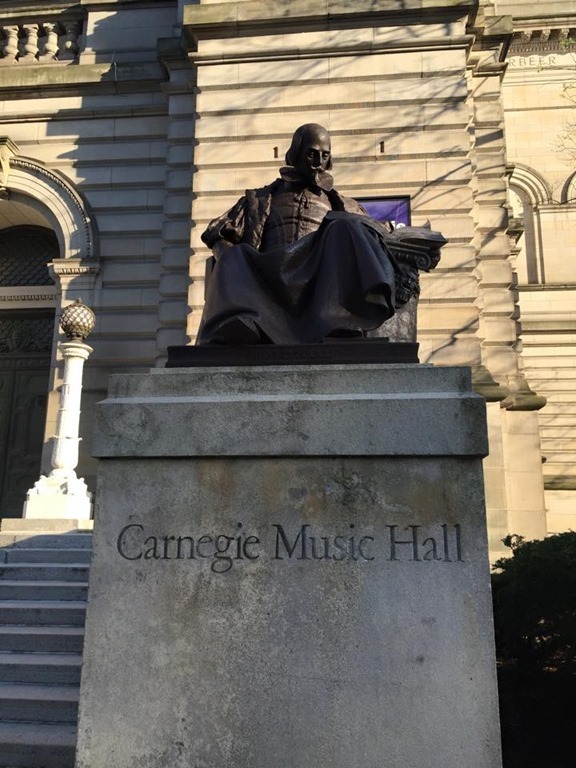 Carnegie Music Hall & Museum (pic 1 & 2). 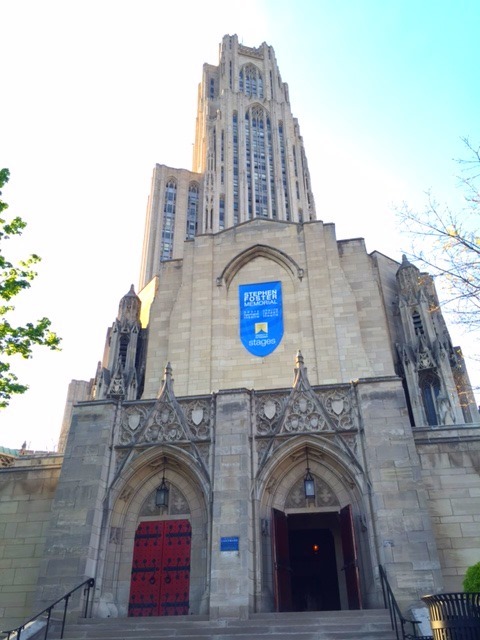 The University of Pittsburgh Cathedral of Learning (pic 3). 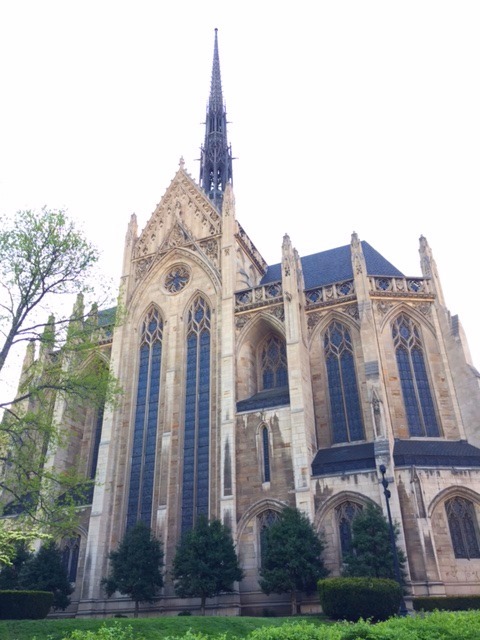 The Heinz Memorial Chapel (pic 4). Race day came and we were excited and ready to run! Temps were warm and the sun was shining. There were 4 corrals. Staggered start with 5 minutes between corrals. Start was crowded and we spent the first several miles running on the sidewalks to get around the walkers. Then came the bridges and hills. 16th Street Bridge. 9th Street Bridge. 7th Street Bridge. West End Bridge. Birmingham Bridge – which isn’t yellow by the way! It’s green. Why isn’t the Birmingham Bridge yellow like all the rest? The most difficult hill to climb was at mile 12. I stopped running the climb about 1/2 way up. Good decision on my part. It was too much for my body so I took my time and ate a few of my Sour Patch Kids and watched everyone else struggle up the hill. Best downhill was at mile 24. One LONG downhill that I was thrilled to see, then it flattened out for the last 2 miles to the finish. Great spectator support by all 13 communities! I loved the music and bands. The kids and volunteers. So many great homeowners put out sprinklers and dug out water guns for the kiddos, fed us oranges, licorice, candy, pretzels, offered beer and handed out water in little dixie cups . Many thanks to the firefighters who opened the fire hydrants for us! Temps climbed to 78 degrees and it was full sun, all day long. I was beyond thankful for the plethora of water stations, ice stations, cold rags, multiple fueling stations that offered either Carb Boom Energy Gel or Pure Protein bars. This was a great race. Not easy but a big city race, done right. There was never a dull moment. 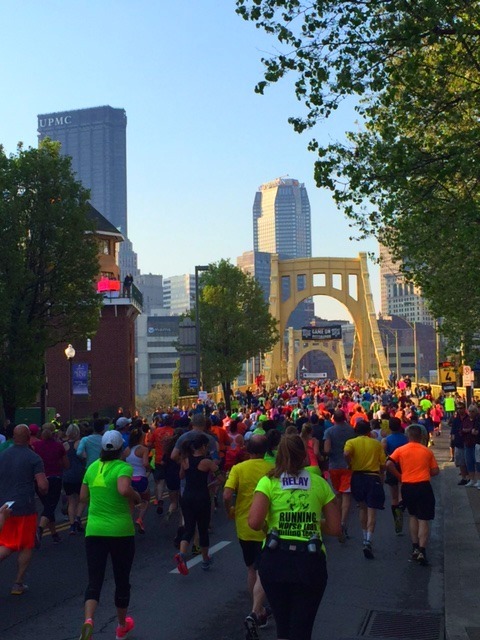 Pittsburgh, you rocked this marathon and I thank you! Great race. If you’ve been thinking about trying Pittsburgh, I’d highly recommend it. Expect a big city race with great crowd support and plenty to see while you are pounding out the miles. Try to take your time and enjoy the city and what it has to offer. 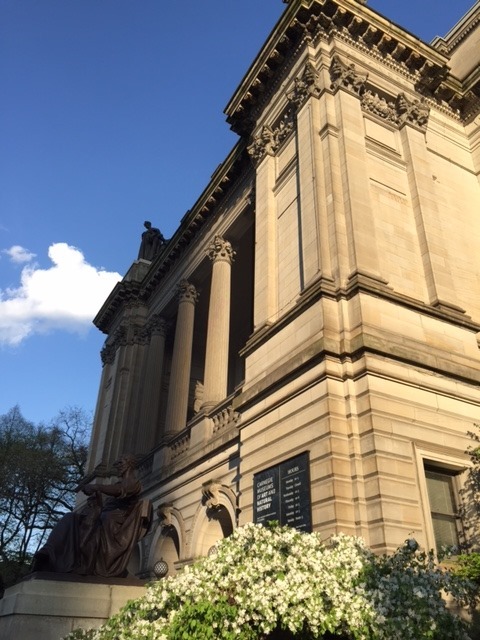 Lots of amazing buildings and homes with beautiful, old architecture. 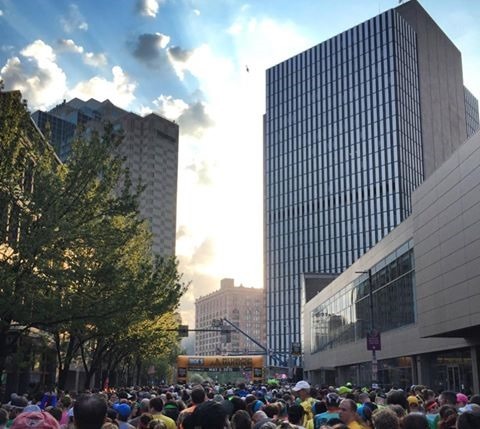 Go run Pittsburgh! 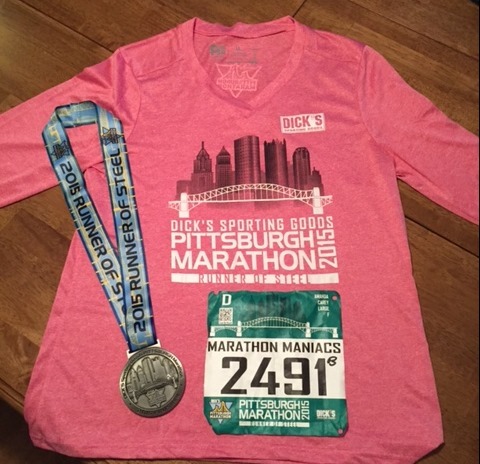 This entry was posted in Race Reviews, Running and tagged Marathon in Pennsylvania, Marathon Maniacs, Marathon with hills, Pittsburgh Marathon, run happy, Run Pittsburgh, Running, Siteseeing Pittsburgh by tootallfritz. Bookmark the permalink. I ran this race too and was a bit worried that the heat was going to crank up but it wasn’t all that bad. I was able to snag a PR by less than a minute but I’ll take it! Good luck on your quest for the 50! Great job! Rough course for a PR! I cannot tell a lie. 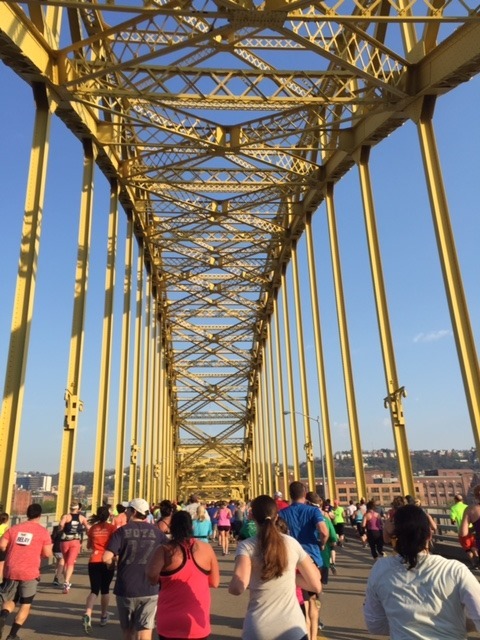 I have been avoiding Pittsburgh because of the bridges and hills, but I may try the Half next year. Your post has me considering. The bridges are all in the first half and there aren’t too many hills at the beginning. Half turns off before we climbed the big hill at mi 12. You can totally handle this! Good going finishing on what is a fairly tough marathon course! 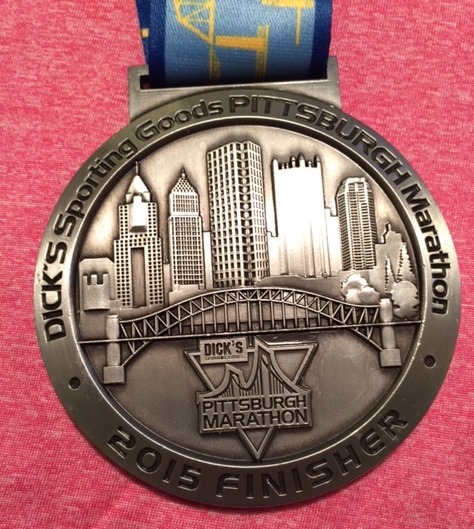 Someday I will run Pittsburgh…if I still hold the desire and motivation to do the 50-state marathon thing. Last I checked I only have 12 or 13 states…would be a long and expensive road to rack up all 50! I have to concur with your assessment…the city has a lot more to offer than just running a marathon. I guess a city with a lot of bridges for its marathon is a good thing…the bridge a good metaphor for life…you cross a lot of bridges in life…might was well follow the same path in your marathoning! WOO HOO!!! Rock on, Amanda!!! Great job and way to push through!!! I absolutely loved reading this recap with all of the details and pictures. I really appreciate your mindset about just taking the race one mile at a time, and not stressing about the hills. I’m so glad you had such a great experience! My husband is a Pittsburgh native and it was very touching for him to read all the great stuff you said about his hometown. COMPLETELY agree with you regarding the Steeler fandom mania there – it really is unlike anything I’ve ever seen. Those bridges are amazing, too. 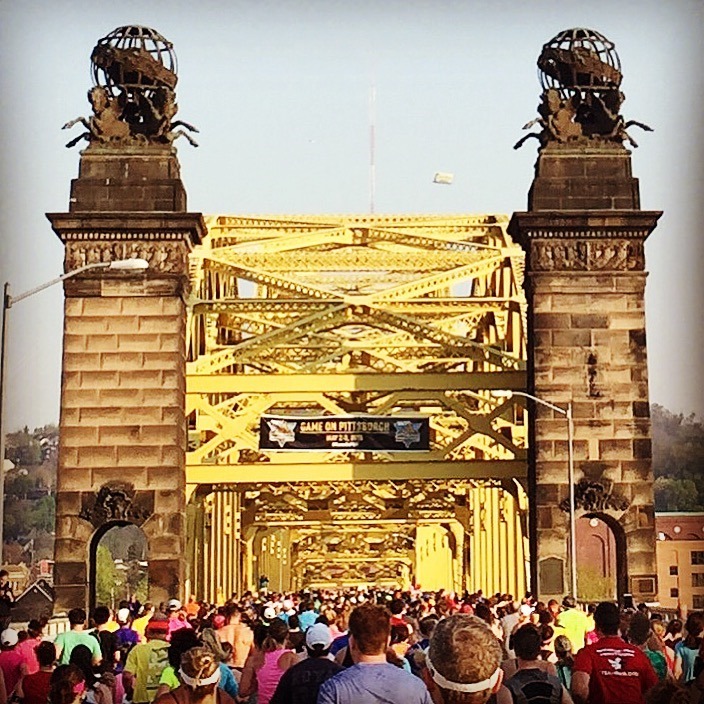 I run the PNC Turkey Trot in Pittsburgh every year and the bridges are by far the biggest highlight for me. You’ve got me really fired up to run this race sometime very soon! Awesome job Amanda! Looks like a beautiful race. I love the shirts too! Sounds like you had a ton of fun at yet another marathon. I was surprised at the numbers for this – 14,000 half marathon finishers is a huge race. And yeah, those hills look pretty intimidating on paper, but at that point, what can you do? Might as well just gnash your teeth and get it done. I’ve only been to Pittsburgh once and I do remember a lot of elevation near the river. Glad to see the bridges are prominently featured.